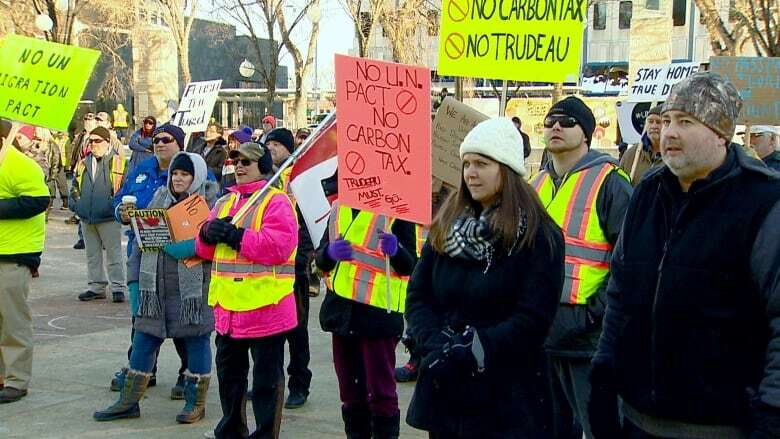 The protest movement has now spread across the globe, but in Alberta, which may be Canada's centre of anti-carbon-tax malcontents, the yellow vest protests Saturday were free from physical violence. Four people were killed, hundreds injured and streets were littered with flaming cars and broken glass as thousands clad in yellow vests partook in violent protests in France in recent weeks against a planned increase to the fuel tax. The protest movement has now spread across the globe, but in Alberta, which may be Canada's centre of anti-carbon-tax discontent, the yellow vest protests Saturday were free from physical violence. "We are Canadian, we're not anywhere close to that kind of radical," said Allison Prentice, who was clad in a yellow vest at the Calgary protest. "I'm proud to be here and represent people who care about Canadians first." The burning anger, which seemed to be lit by multiple fuses, still meant threats of violence were on the lips of attendees who linked frustration over economic woes caused by low oil prices to the country's immigration policies — a sharp departure from the wide-ranging motivations of French protesters who appear to be primarily concerned with wealth inequality. 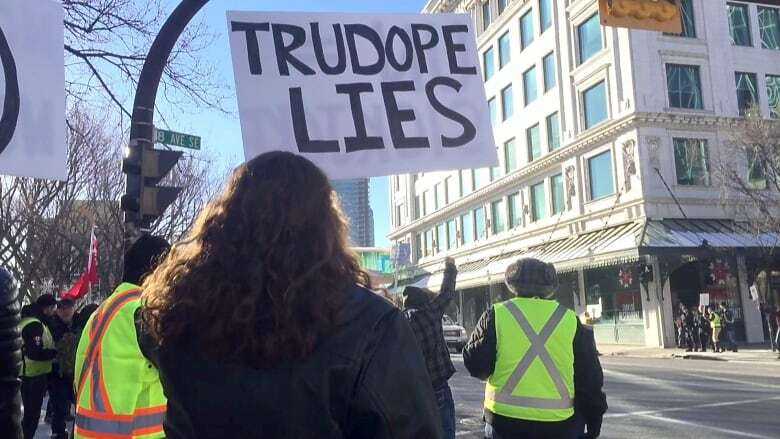 In Calgary, more than 200 protesters, some accompanied by dogs also decked out in yellow vests, chanted "No Trudeau. No Trudeau" outside of city hall. Some yelled "String him up," others yelled "traitor." "They hate our country and they hate our way of life," yelled one speaker through a megaphone, to cheers and whistles, not specifying who "they" are. Calgary police said the rally was peaceful and no protesters were arrested. Edmonton also saw a large protest, with hundreds marching from the Legislature to Churchill Square, carrying signs, some reading "No Global Climate Pact. Suicide." 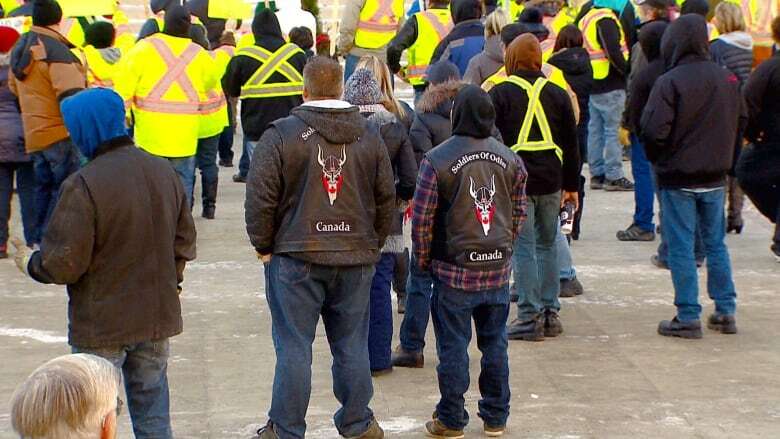 Multiple posts on Canada's yellow jackets Facebook page called for more drastic action. "Look at France today. After four weeks of burning the cities, the French government cut the carbon tax. So what do we want? 90 years or four weeks until something changes?" wrote Robb Kerr on the group's page. "If you want to crush a government, you have to play their game … You want to see them jump? Then burn down City Hall." The protests were jointly against the provincial and federal carbon taxes, and Canada's plan to endorse the United Nations' migration pact, which outlines objectives for treating global migrants humanely and efficiently. "I'm here for primarily the fact that I know many people who barely get by month to month, so until we can take care of our own, I'm concerned that the money we don't have are going to people that don't have the right to have it, before our own," said Prentice. Attendee Peter Lebrun said he feared the non-legally-binding UN Global Compact on Migration would harm the country. "I think that opens up a lot of possibilities that would prove to be negative to Canada as a whole," said Lebrun, another attendee at the Calgary rally. Members of Soldiers of Odin were also in attendance in Edmonton and Calgary. The anti-immigration group was founded in 2015 in Finland by a white supremacist. Stephen Garvey, the founder of National Citizens Alliance, a Calgary-based political party that says it's in favour of "integration not immigration," and one of the organizers of the Edmonton rally, said the sentiments expressed at the events have been building over some time. "There's massive censorship of media," said Garvey, referring to the UN migration pact. "This is un-Canadian … Canada has to be about the Canadian people. It can't be about people sold out to some globalist agenda to the UN, in Ottawa." Speakers at both rallies decried the media, saying there hasn't been enough attention paid to their cause. "There's no media outlet here today. The Liberals bought CBC. They're not coming," said one protester in a Facebook live video of the Calgary event.